Spring flowering and with masses of flowers, Iberis is an evergreen plant that works well in many landscaping schemes. Available in a number of varieties from wholesale growers. 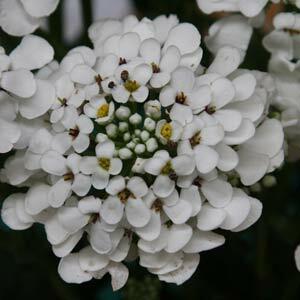 Better known as ‘Candytuft’, Iberis sempervirens (syn I. commutata) is an excellent low growing plant with masses of white flowers in spring. Usually grown as an evergreen ground cover plant and offered in trays as well as pots by wholesale growers..
Lots of cultivars such as Iberis sempervirens x gibraltarica, white flowers with mauve to purple centres is a standout plant when in full bloom. I. sempervirens ‘Absolutely amethyst’ with wonderful mauve flowers are two of the many varieties offered by wholesale growers. In landscaping most species look great when allowed to tumble down over retaining walls, and look equally good in containers, rock gardens or in the garden border. Depending on variety they will reach around 20 – 40cm in height and make excellent low maintenance border plants for both commercial and residential landscaping projects. Best grown in full sun in a humus rich well drained soil. Iberis or ‘Candytuft’ are available from the following wholesalers.